Over the next few weeks there will most definitely be some changes through our house as I begin to decorate. 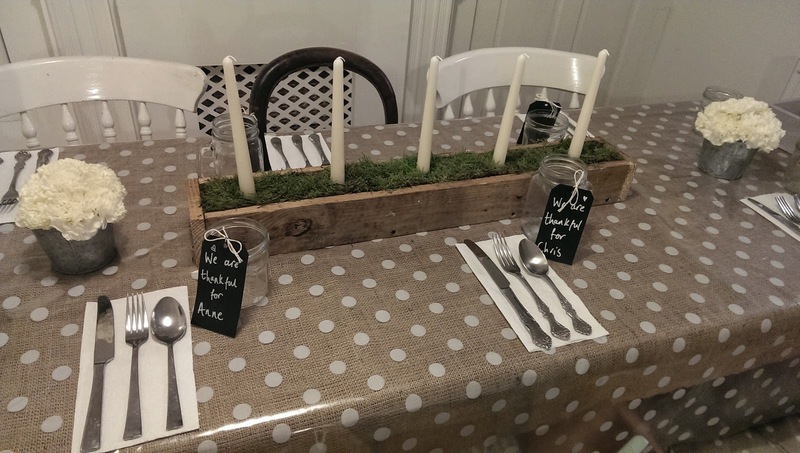 For the beginning of Advent I wanted to start with our dining table. 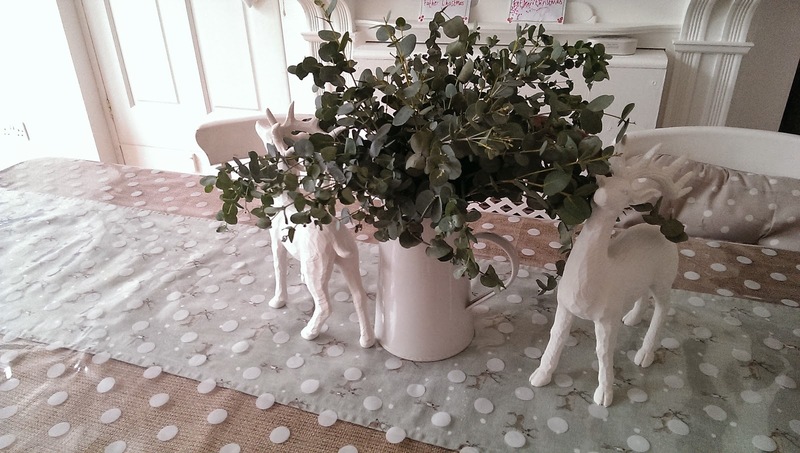 I have the most beautiful Sophie Allport table runner which is a light blue/grey with her deer print pattern all over it. It is so soft and beautiful and perfect for our home. 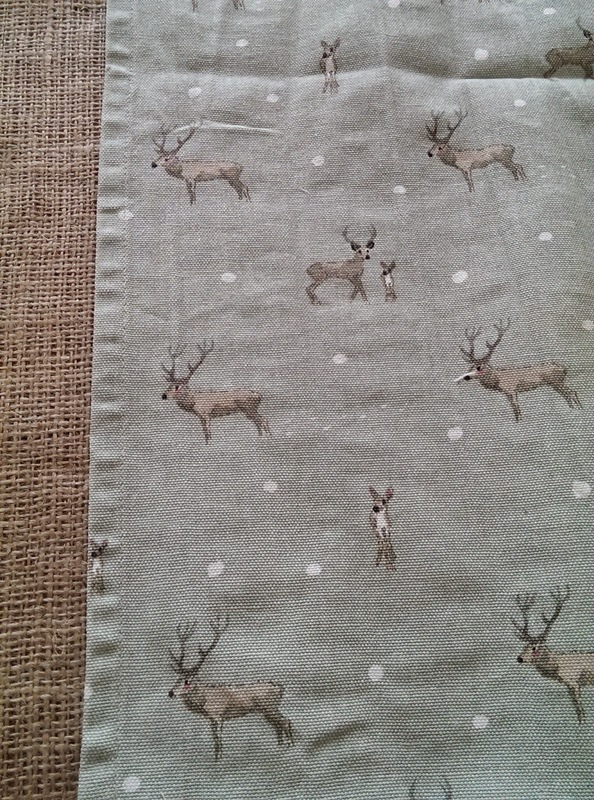 To get us in the mood and to introduce this Christmas's theme (that seems to be Stags) I have arranged the table runner on some plain hessian material that I got from the market. 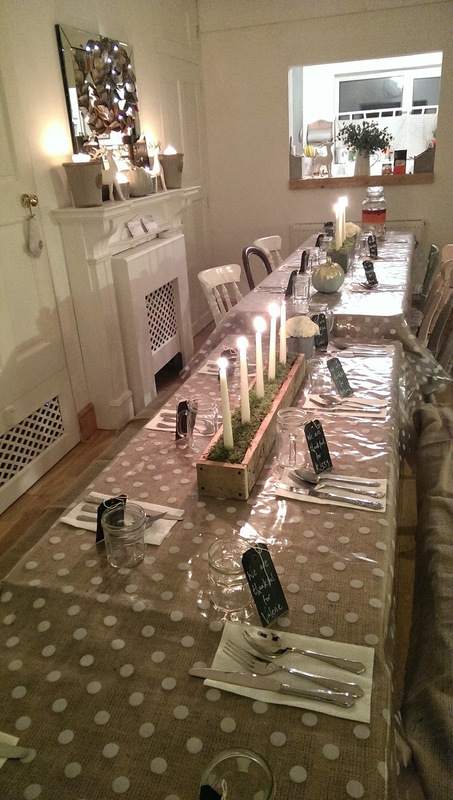 The brown of the hessian really complements the light colours in the table runner. I have then placed my clear spotty PVC from Dunelm on top to child proof it all. 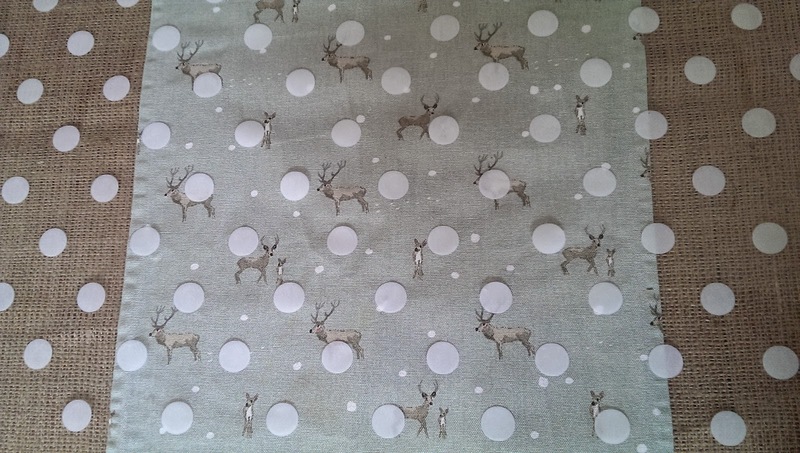 Luckily this suits the runner as it also features small spots. 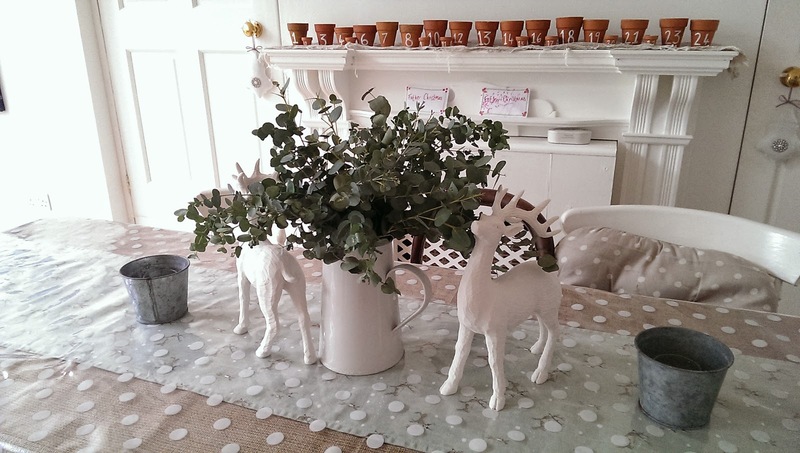 I have then used some Eucalyptus in a white enamel Garden Trading jug and placed two white stags either side. 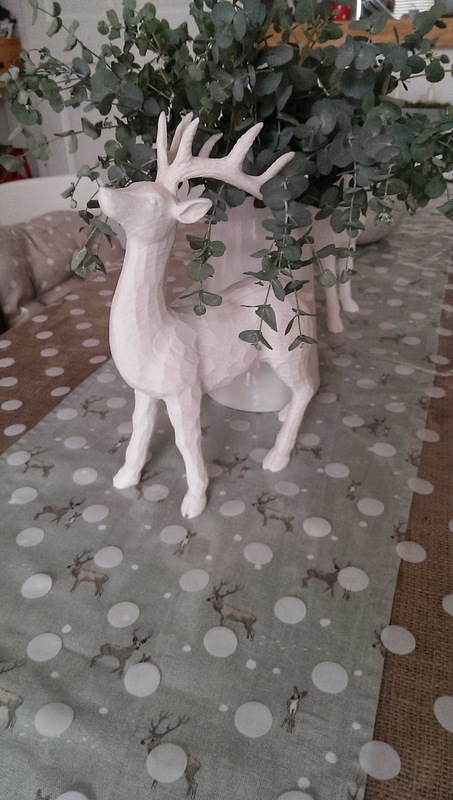 These stags are from Wilkinson's and are £7! I think if you pick carefully, you wouldn't know they were so cheap! They look crisp and clean and suit us perfectly. I have then put our zinc pots either side to have candles in. This is fresh and clean and not so 'Chrismassy' that it looks like we are ahead of the game in decorating! This weekend we celebrate the first week of advent, the official countdown to Christmas! 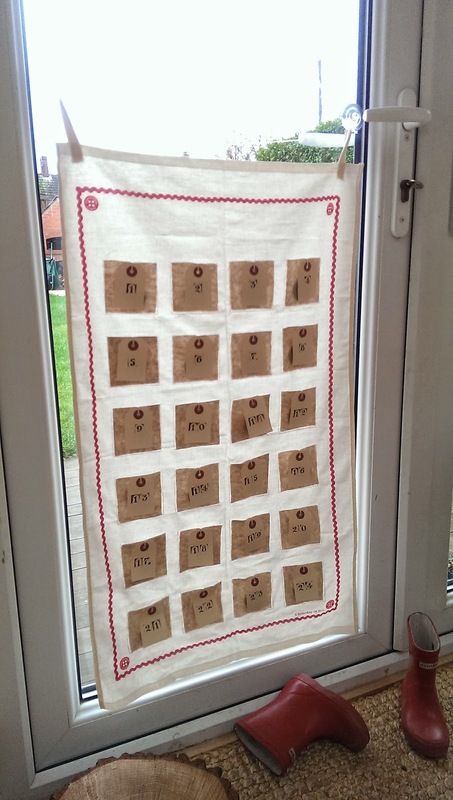 Today I thought I would share a few advent calendar ideas with you that I have made myself and that are really effective especially with children. 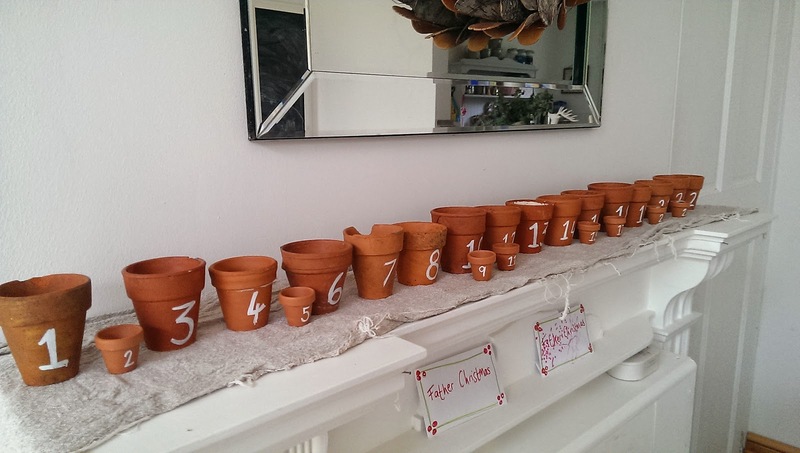 This was the first Advent countdown calendar I made. 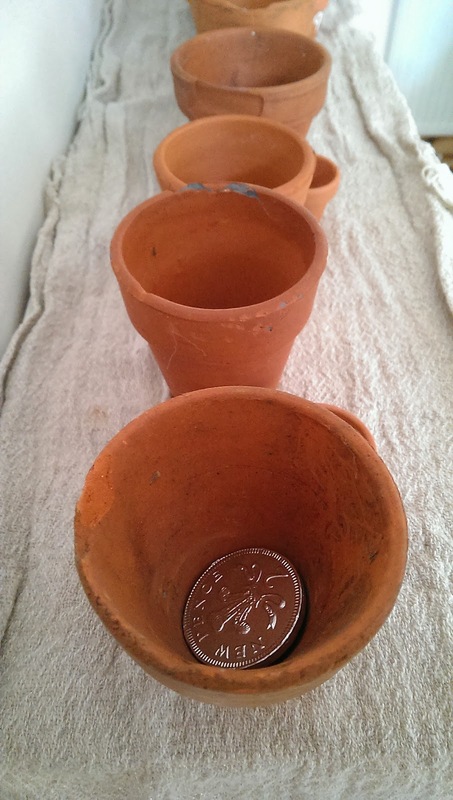 I have used reclaimed, small terracotta pots which I place a chocolate coin in. As each day goes past we replace the chocolate with a candle so on an evening we can light each one as each day passes. 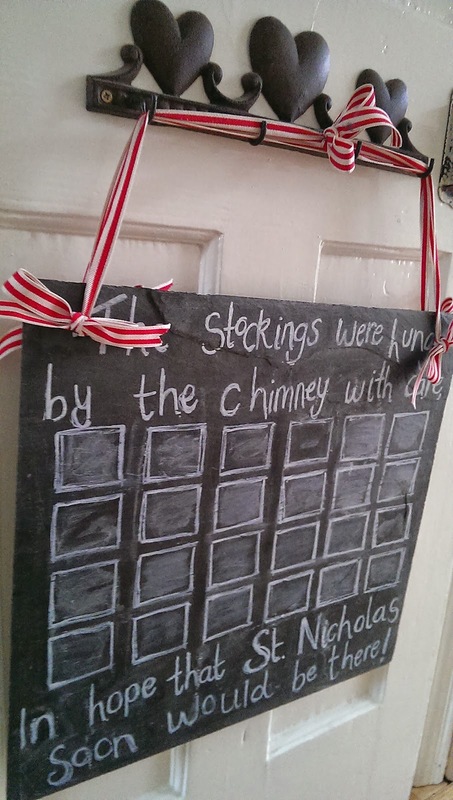 I have used a chalk pen to write each number and have lined them all up along our mantle so it is tricky for little hands to reach into when I am not looking! This second one I have used a reclaimed slate from a builders yard that I have drawn on. 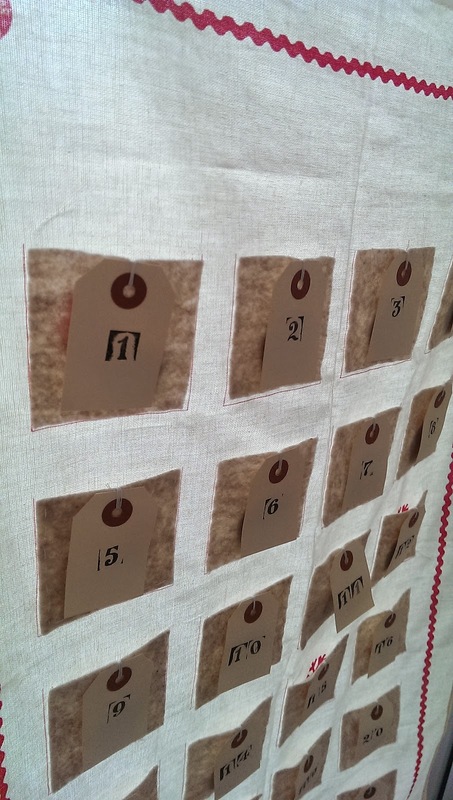 One side is a countdown that the kids can mark off each number as each day passes. 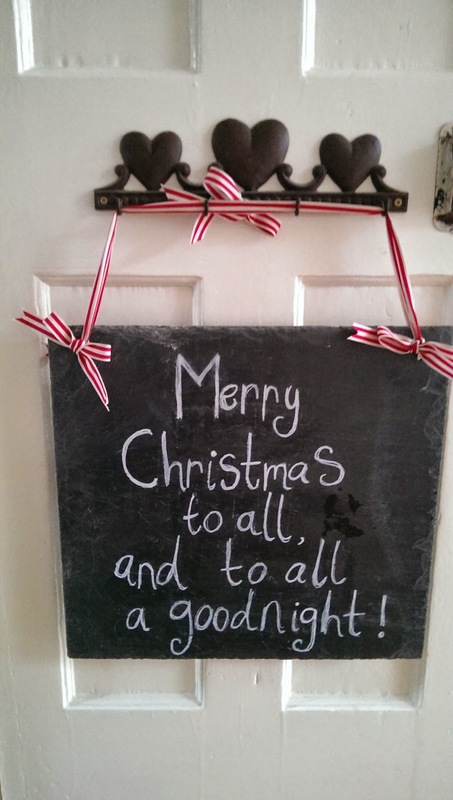 On the other side is then a Christmas message that we turn over on Christmas eve after all of the days have been crossed off. My third one is actually partly from a 'make your own' set my mum got me a couple of years ago. 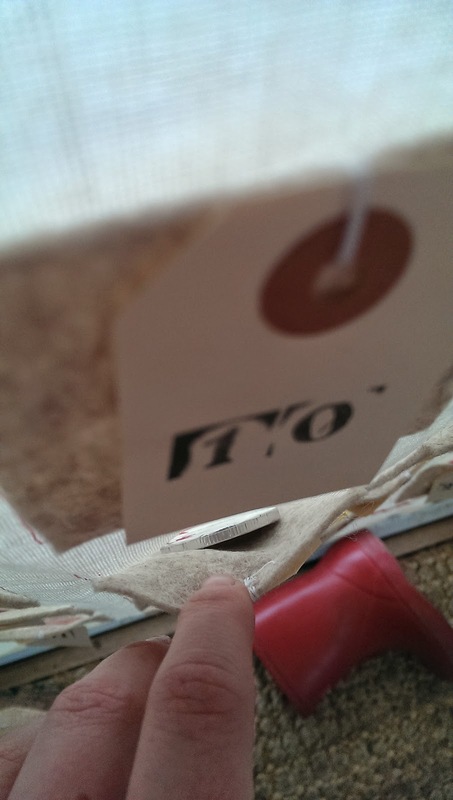 It came with bright coloured felts to make the little pockets out of but I opted for just a plain oatmeal colour and I then cut and stamped little labels for the numbers. I place little coins inside for the children. Really all you could use to make something similar is a tea towel that you can then sew small pockets on to. 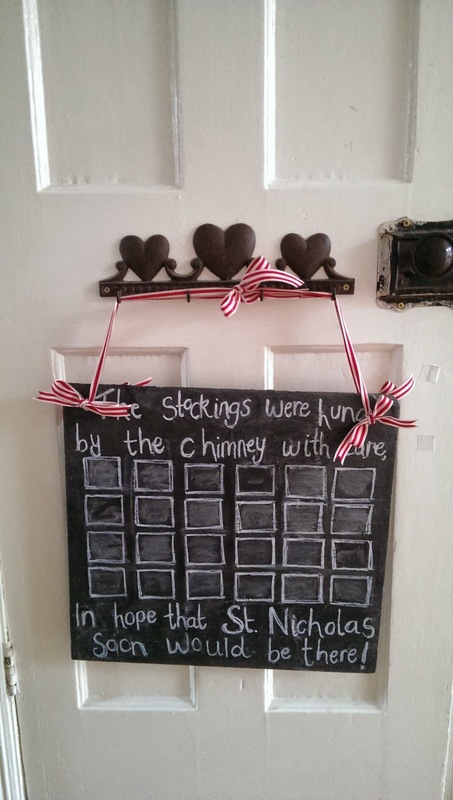 It is a simple door hanger but looks really effective. These are some of our little Christmas traditions. We also have the traditional nativity open flaps calendars that my parents get the kids and another sneaky Chocolate one! Well, there are many posts about a few of the different aspects of the night, food and decor to be precise. The night itself was as lovely as it could have been. The bottom line is, it doesn't matter what Rob and I do to make it look pretty or to impress, the fact is it is family time and that is all that matters. I would say it is a rare occasion when we just have both sides of our family at our dinner table. Birthdays or special occasions are about it really so for us the point of this dinner is to direct everyone's time to just being together. We are lucky that we can offer little extras like the canapés, the meal, the decorations but even if we didn't, just getting together is what is important. On arrival we offered family members canapés and drinks, welcomed them to the decorated table and served them a three course meal. Head chef Rob provided a delicious Jamaican spicy Pumpkin soup to start, bangers and mash with onion gravy for the main and pumpkin pie (made by his sister) and a cheese board for pudding. It was a feast inspired by the traditional American style of thanksgiving dinner. As we cooked for 16 we had to make it easy. Soup goes a long way so it is a great idea for a starter. Bangers and mash are a home favourite and as we have no dietary requirements. It is something we can all enjoy and it does not need many extras. 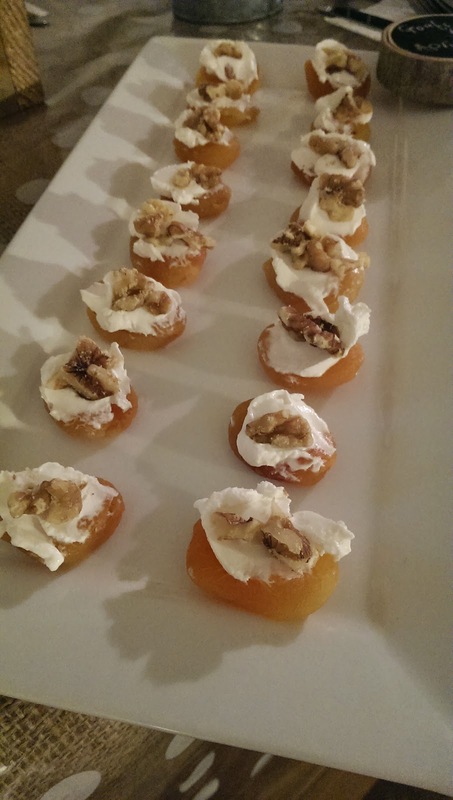 Pudding is a good thing that we find we can share out to guests who ask if they can bring anything. Rob's sister made a traditional Pumpkin Pie and my mum brought a cheese board. This was some serious family feasting. We all had full bellies and chatter a plenty. 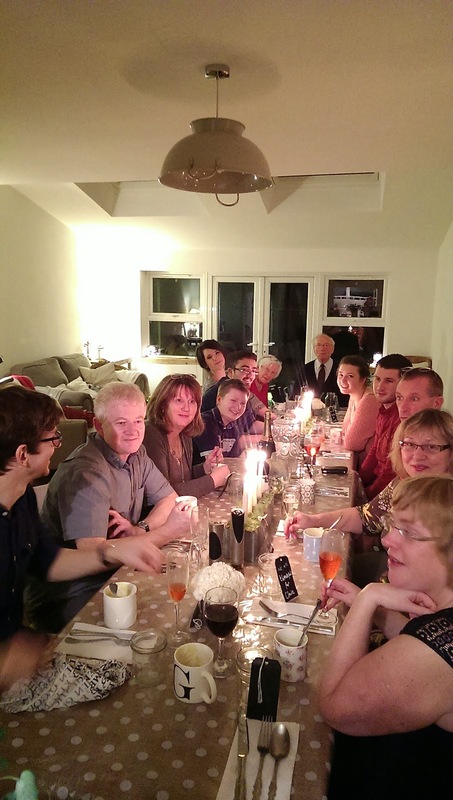 One of the most important things to mention though about the whole evening is that we paused for a point before the meal to say Grace and to thank God for what we had and then during dinner we each went round the table and individually spoke about what we were thankful for. This gave us time to reflect and be reminded about just how lucky we are to have this opportunity to feast in this way but to also to have homes, family and love surrounding all that we do. 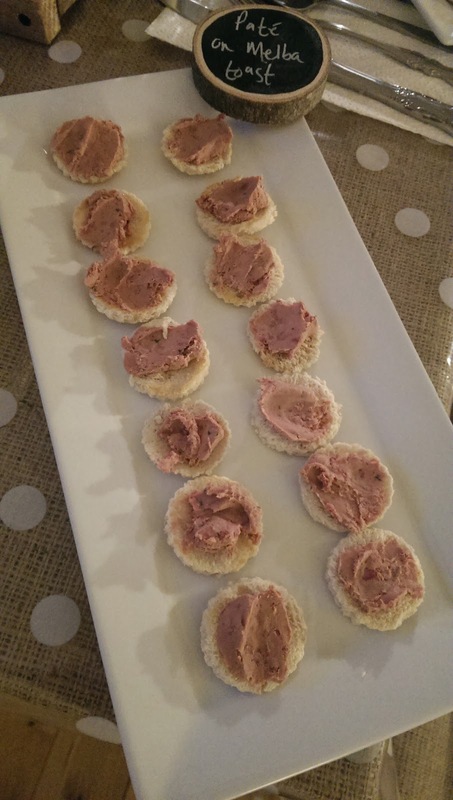 For Thanksgiving I decided I wanted to improve my culinary skills and create some easy appetisers. 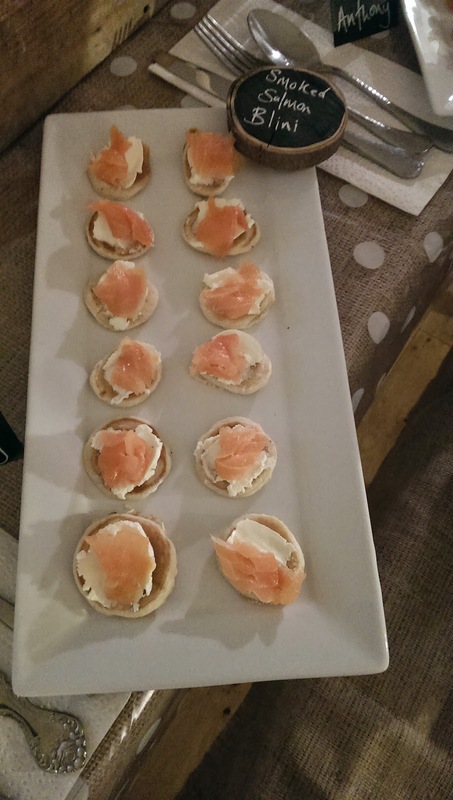 'Easy' as I wanted to show you readers that even if you have limited cooking skills, like me, it is possible to fool your guest into thinking that you are a catering extraordinaire! One of the most important things about creating a professional look for your Canapés is making sure your presentation of them is perfect. I purchased some crisp white table crockery from Matalan to help with this. 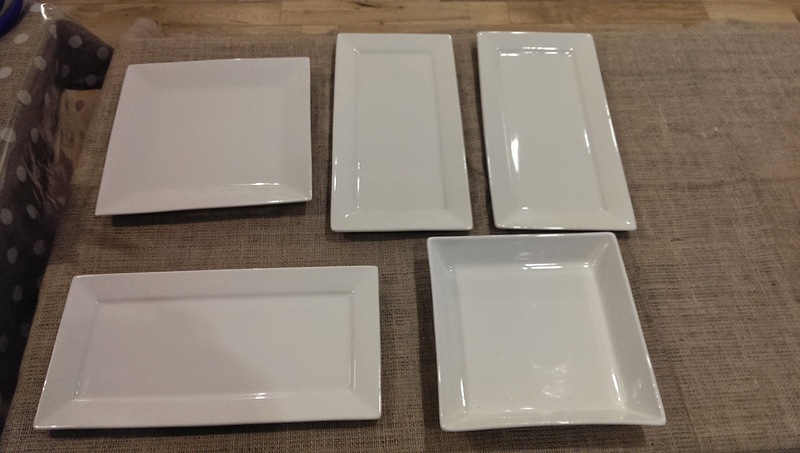 They have a lovely range of smart plain and white crockery so I bought some large serving plates and made a bit of a collection. I think all of the plates were £4 each and they have a range of sizes. This should last me forever now, being white it is classic and smart and will not date. Next it is down to what you serve. 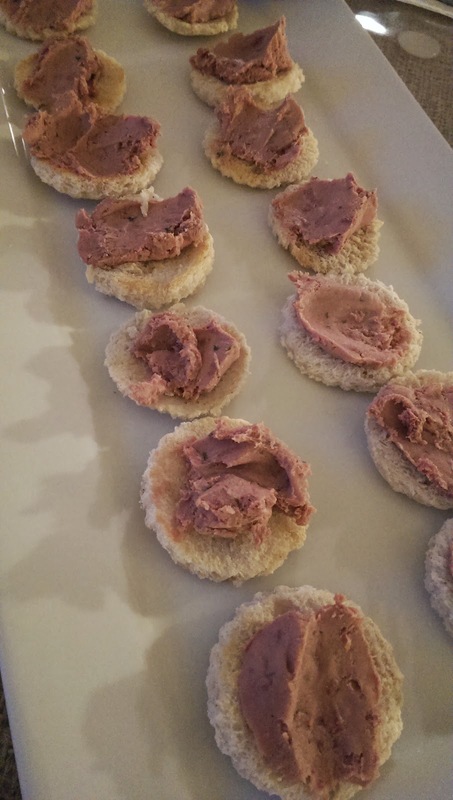 As I am a newbie in the canapé world I have made some basic ones to ease me into it. Melba toast is just super thin toast so this is the trickiest part of this one. Simply slice a normal slice of bread (horizontally) in half. Then I used a small round cookie cutter and cut out as many rounds from each slice. Then toast under the grill. You can toast the slices large first but they are fragile as they are thin. Then smear any type of pâte on top that you might fancy and place nicely on a plate. This is really easy. 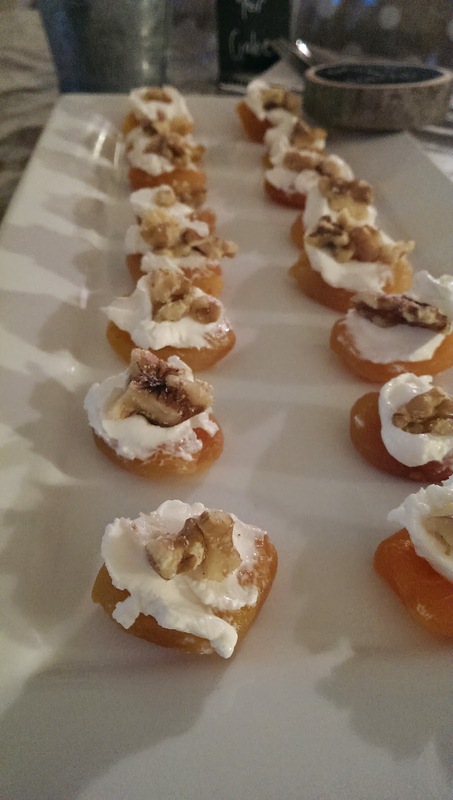 Get some dried apricots and smear a chunk of goats cheese over the top. Smash up some walnuts to create a fine crumble and dust them over the goats cheese. Then quickly drizzle a small amount of honey on top. So I looked up a blini recipe and found that you need special flour and ingredients to make them. On telling Rob he told me to 'man up' and just make tiny pancakes. I don't know why I didn't think of it!! So with my egg, milk and flour mix I used a melon scoop (as it was the perfect size) as a ladle to make tiny round pancakes. 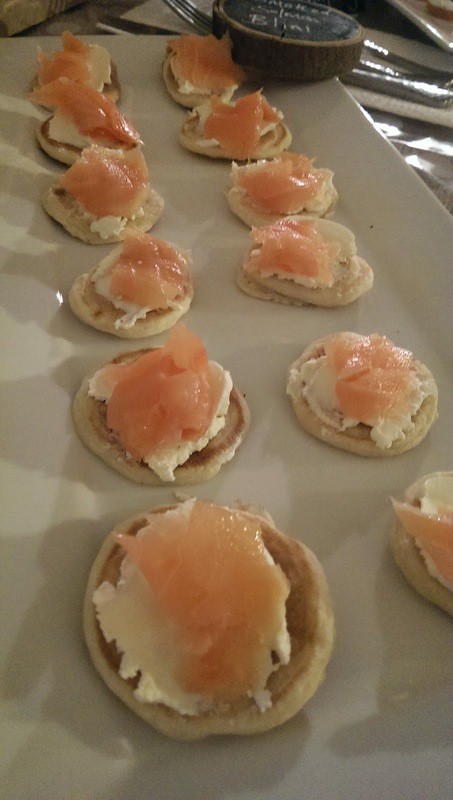 Once cooled give them a smear of cream cheese and place a bit of smoked salmon on the top. You can drizzle them with fresh lemon if you like. A delicious mix for people to pick at. 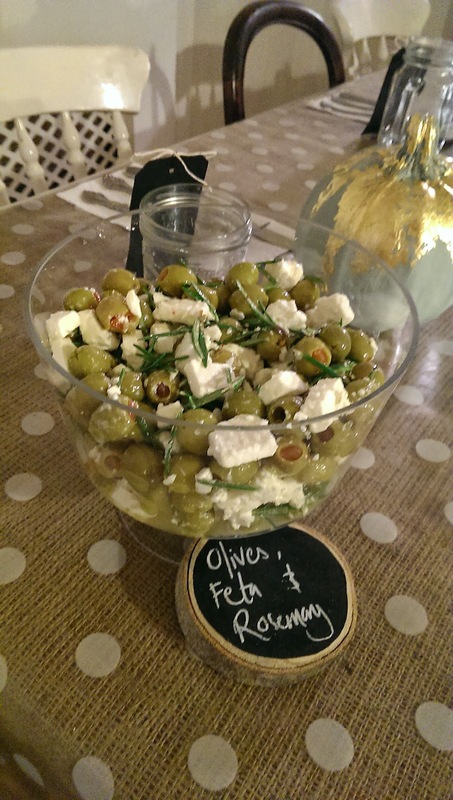 I am using the plainest olives as they are the cheapest and adding them into a mix of olive oil, chilli oil and rosemary. Give it time to sit then add in chunks of feta cheese. 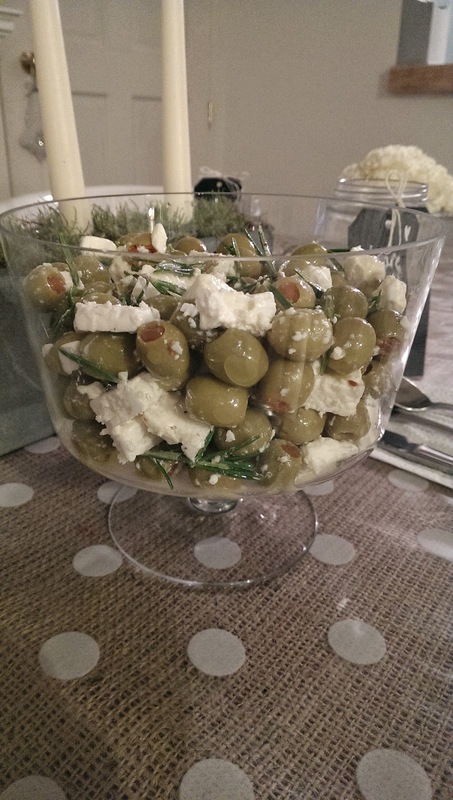 This served in a glass bowl just looks amazing! 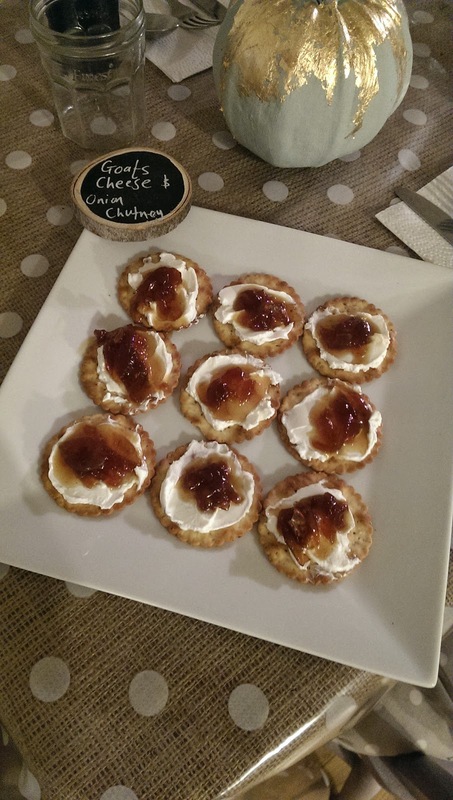 Using some small crackers, mine are herb infused, smear your goats cheese on top then add a small dollop of chutney. Place nicely on a plate and enjoy. 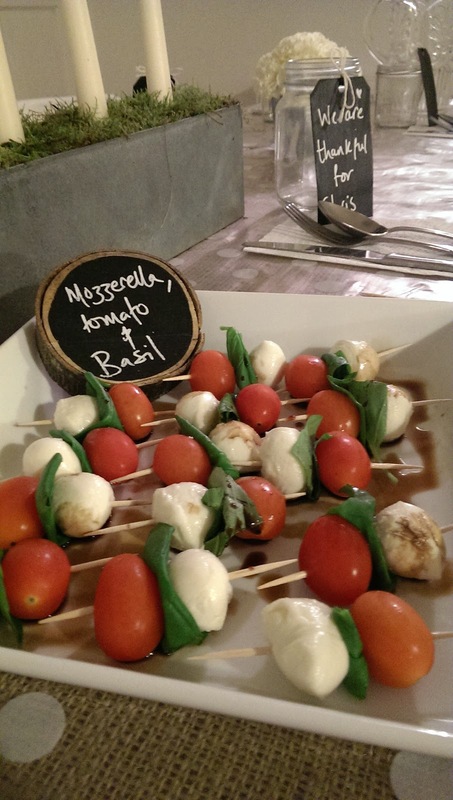 This is a tiny kebab of italian flavours! 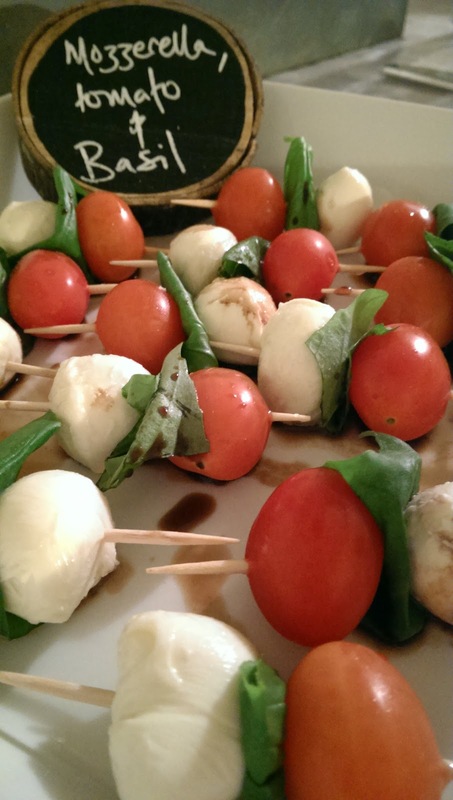 Simple skewer a mini mozzarella ball, fresh basil leaf and cherry tomato together and drizzle with balsamic vinegar. If you can not buy you mini mozzarella you can just chop a large one into chunks. You might want to put these in a dish with sides due to the sauce. So there you have it. These need a bit of prep work but are quite straight forward and look great when presented nicely. They are perfect for any party especially drinks parties with friends. 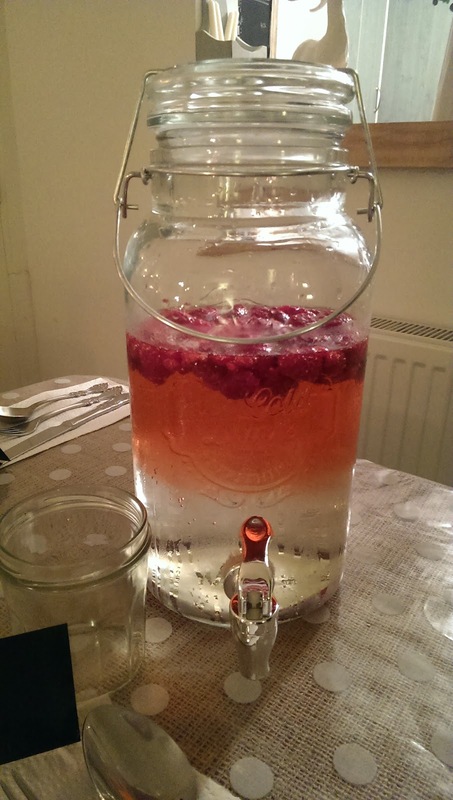 This is perfect for tonight's dinner party and I have used some Belvoir Elderflower Cordial, Lemonade and frozen raspberries to fill it with. 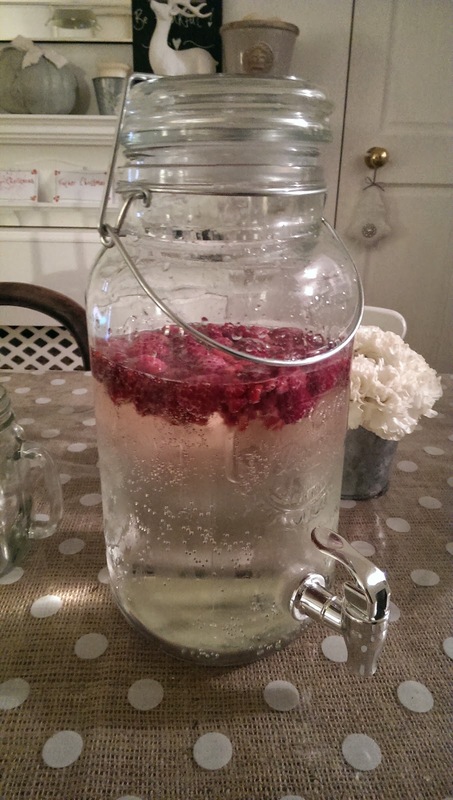 I love that the raspberry colour oozes into the mixture and gives it an ombre effect. 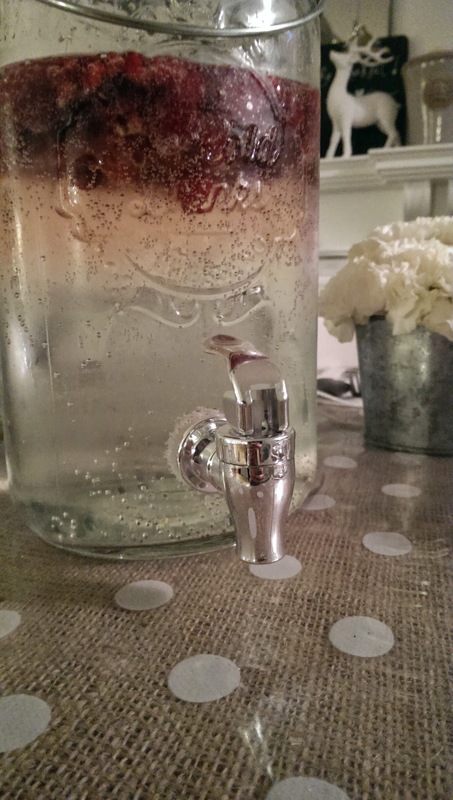 It looks great and gives your guest a little fun when getting a drink. 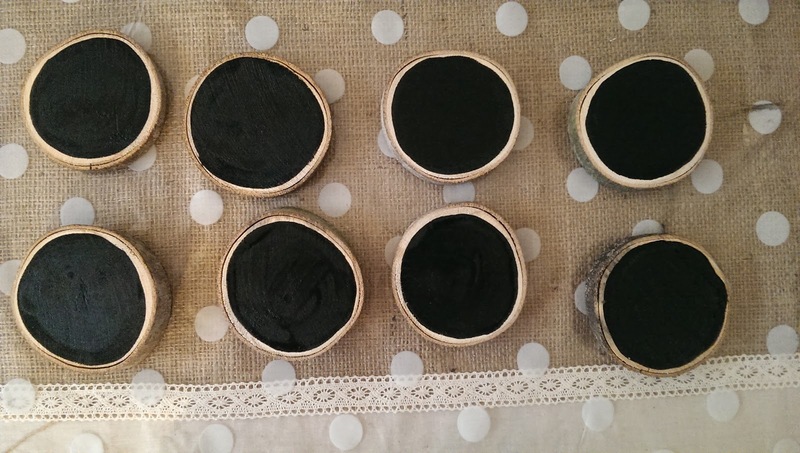 I just love Chalk board paint! Seriously, if you buy some you will also become addicted. It is so versatile and is just about great on everything. We made a huge floor to ceiling chalkboard for our house and i just adore it. 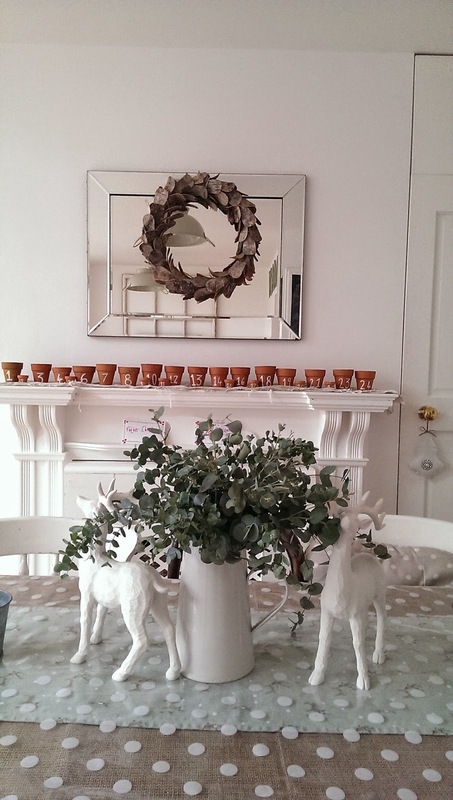 It is perfect to decorate with and is great for ever changing displays. I buy mine from our local Wilkinson's store. It's their own brand and is really good. 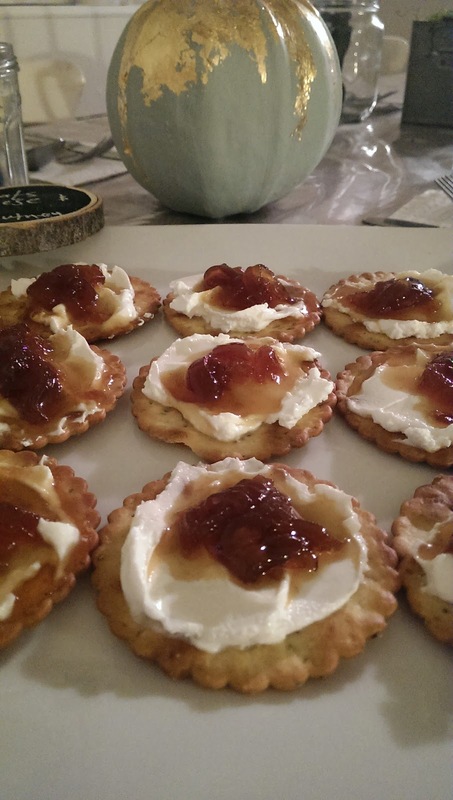 To help with some Thanksgiving dinner prep I decided I wanted to offer Canapés with drinks to start. 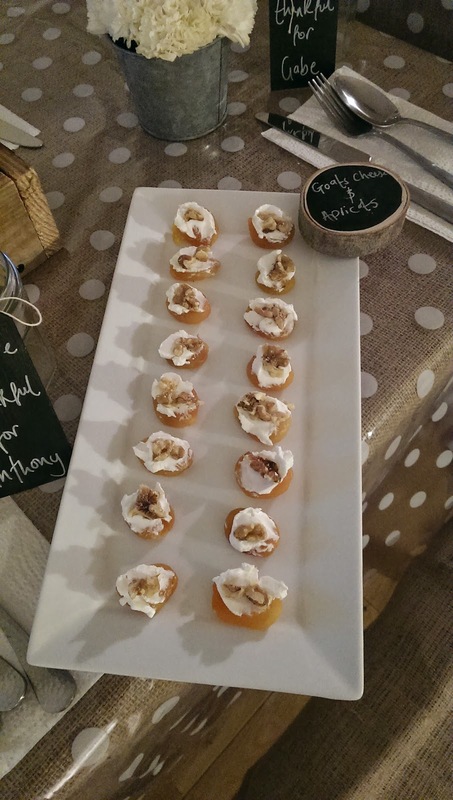 I have some lovely plain white plates and I wanted a little something to place on them to identify each canapé. 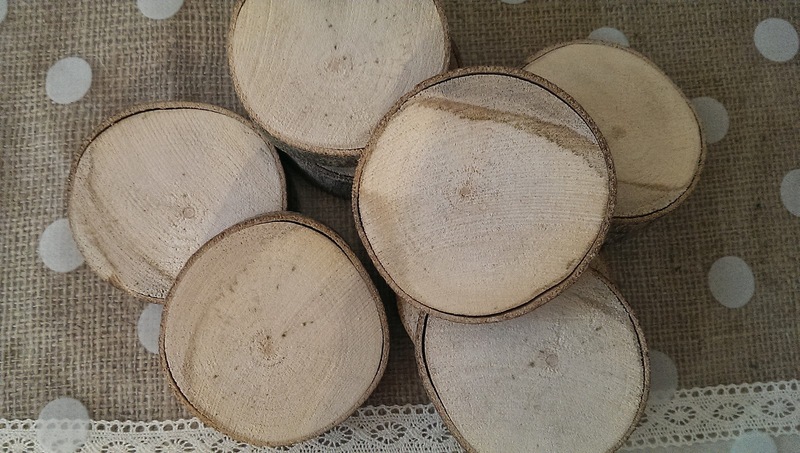 I had some small slices of wood which we must have cut last year. 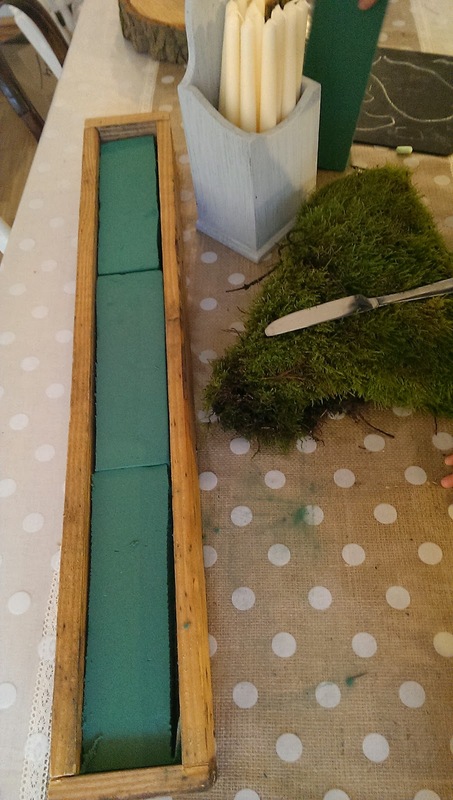 It was simply a branch which Rob chopped into 2 cm thick slices. As they have been cut for some time they were nice and dry so after a light sand I slapped on a coat of chalk board paint. 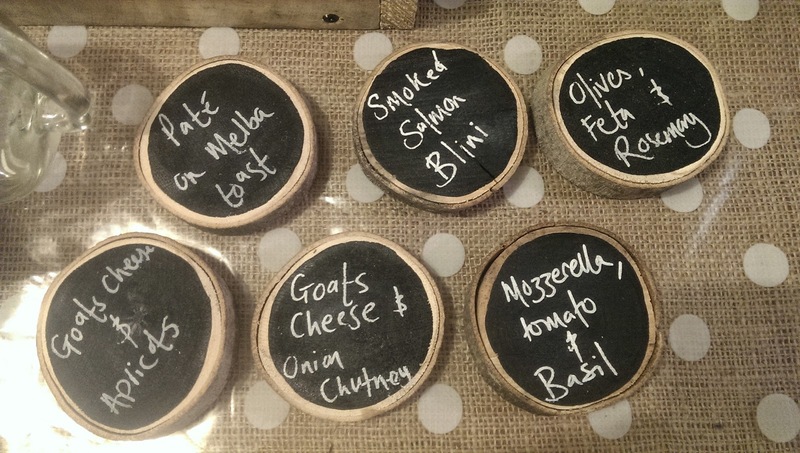 Using a chalk pen I have written on each appetiser and will place on the plate when they are served. 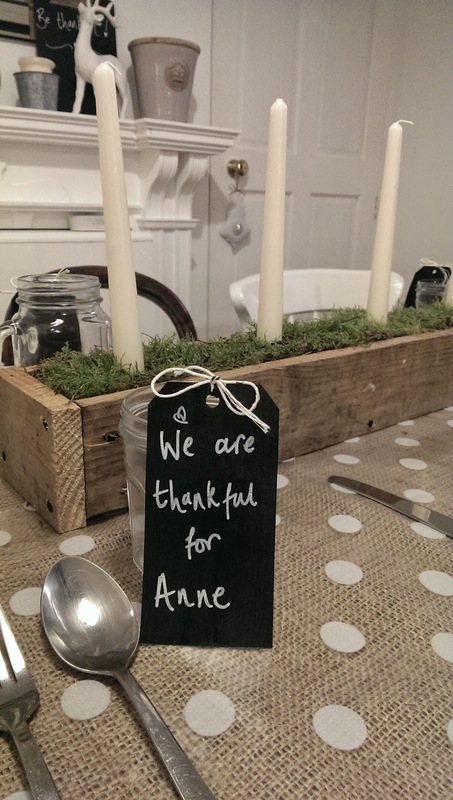 This is so easy and can even be used as place names for your table settings. Could look lovely on a Christmas table. Now I cannot take credit for this next idea. It was my mum's but it is to good not to share! 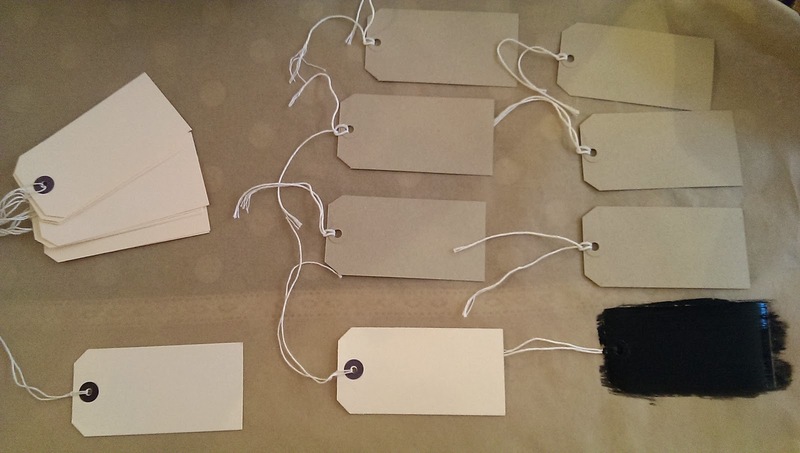 These painted labels are perfect for place settings, gift tags or little cards. 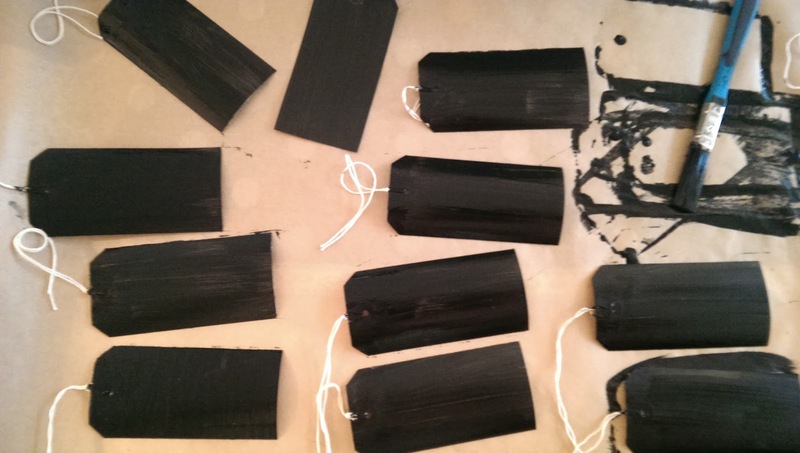 I have simply painted a brown luggage tag with chalkboard paint and written on them with a chalk pen. 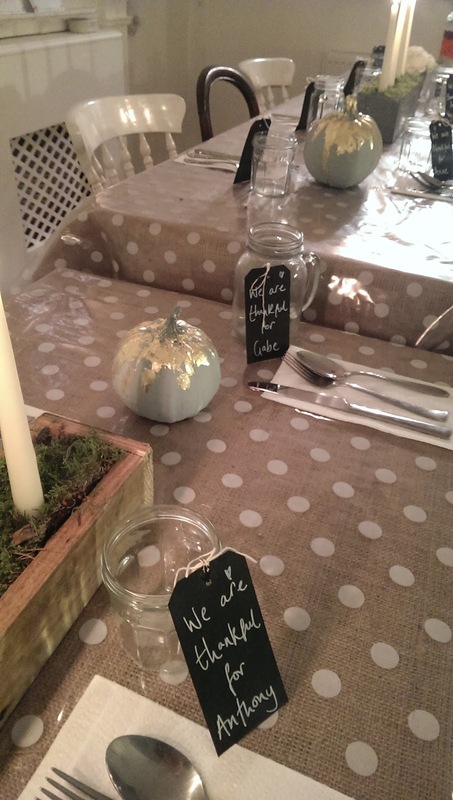 The black and white looks great and they look perfect with our table settings. 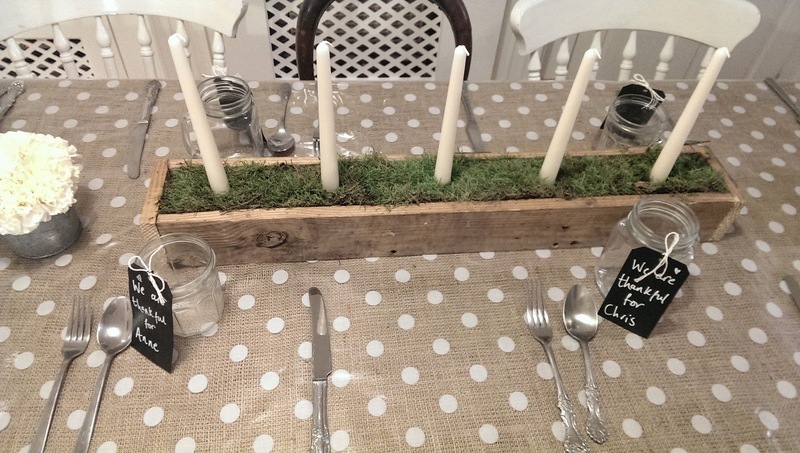 I love the effect that it gives and with the neutral hessian (from the market at £3.99 per meter) and spot tablecloths (Dunelm at £2.99 pm) . 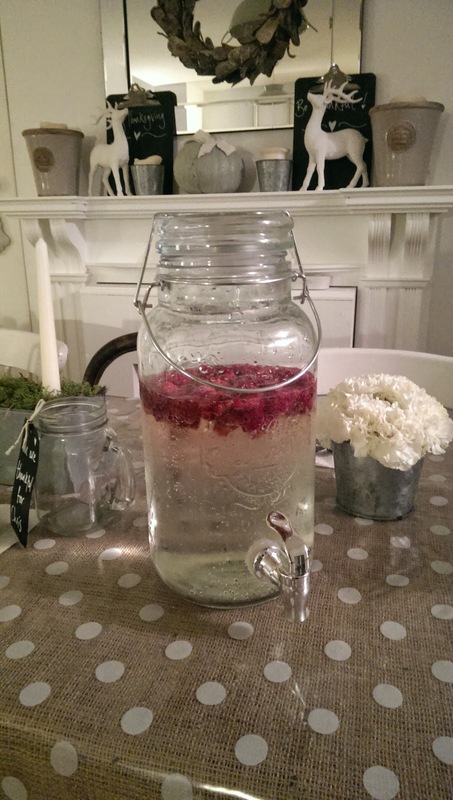 This is a really cost effective way to decorate and create a pretty dinner table. 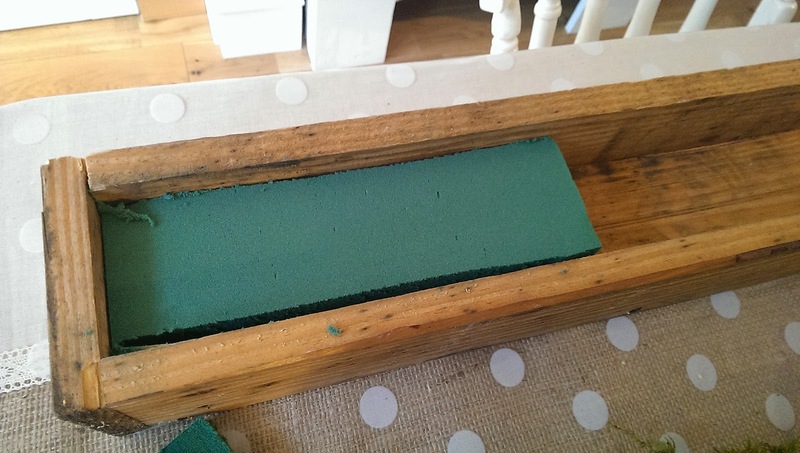 You might of seen our blog post on a pallet wood box that Rob made for using on our dinning table. Click HERE if you would like to see the post. As it is Thanksgiving today I have been busy setting up and have lots to share but I thought I would do it over the next few days. I love getting ready for parties. I like thinking about all the little details but also thinking about how I can make bits and not spend a lot of money. You see all these beautiful images on the internet of gorgeous table settings but I just can't compete. With having a busy life and two kids I am always pleased with what I can come up with even if it isn't as outstanding as the magazine images! This box was a very easy make for Rob. I thought it would be nice to reuse it for thanksgiving as we are having a lot of people round and I didn't want anything that took up too much room on the table. As this is thin it is perfect for just running down the centre. Using the box I filled it with Oasis bricks that I cut to size. You can get these from any Florist's shop, mine is from The Arbour on Steep Hill, Lincoln. 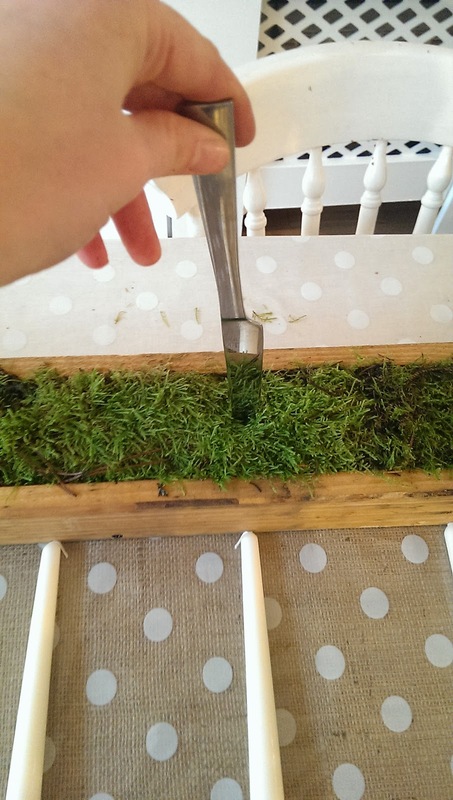 Then I used a sheet of moss, I cut it and just place on top pushing it down at the edges. 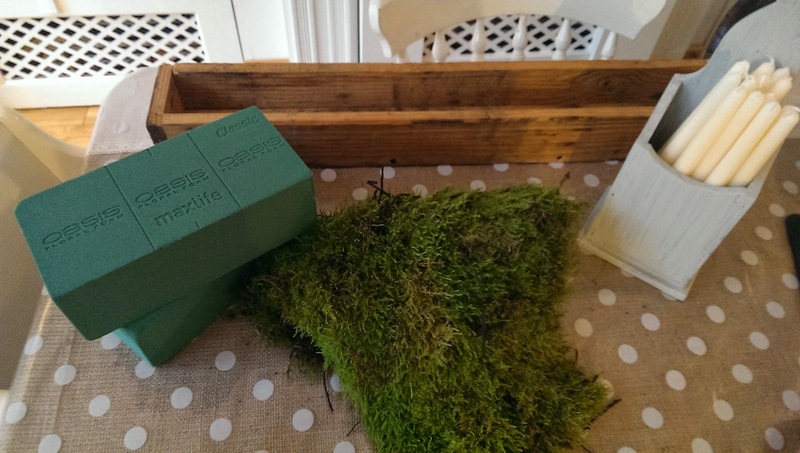 This is also available from most florist especially at this time of year. 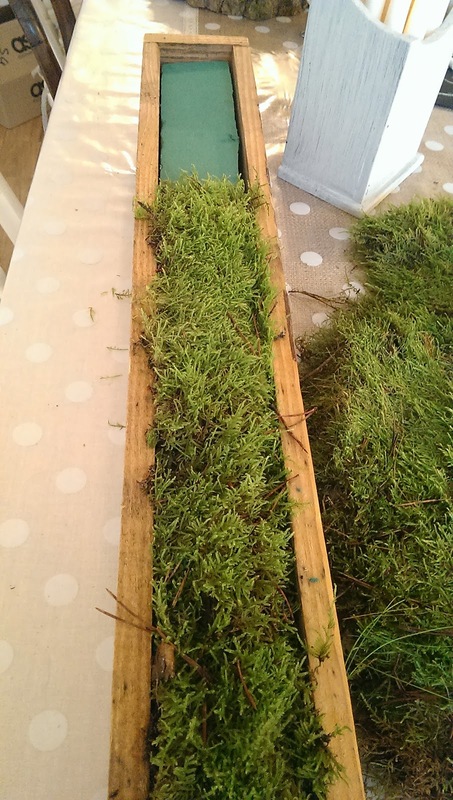 If you fancy it, you can use moss from the garden or the woodland areas. 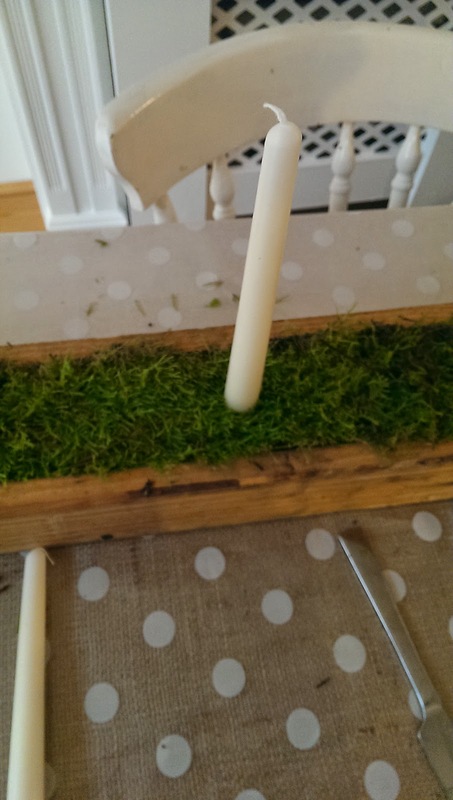 Then I lay out my long candles in the positions I wanted and used a knife to stab down through the moss and Oasis to make an opening point. 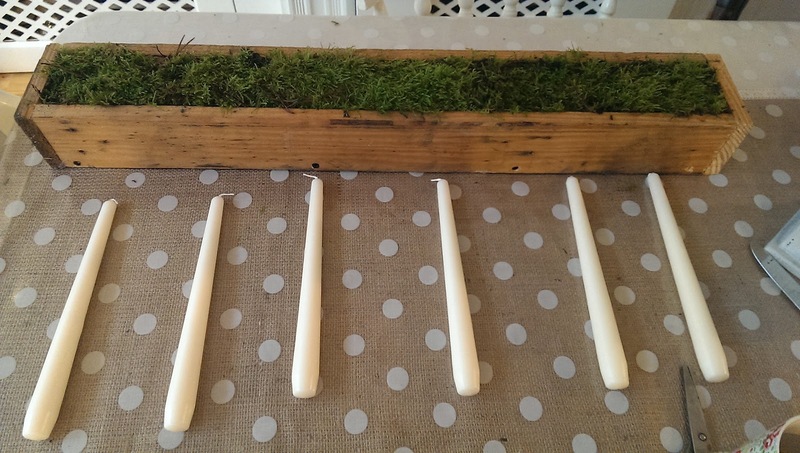 The candles then were gently pushed in . 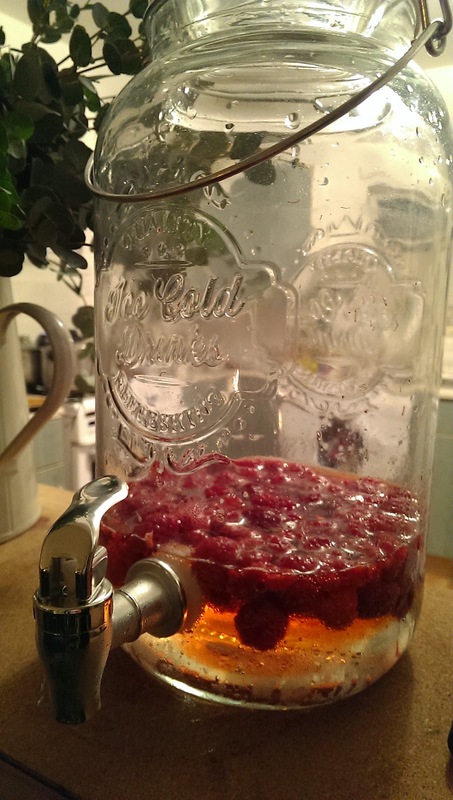 The Oasis moves to suit the size of what is stuck in it so just press straight down until you feel it has gripped. It looks really pretty and fresh and is simple to achieve. 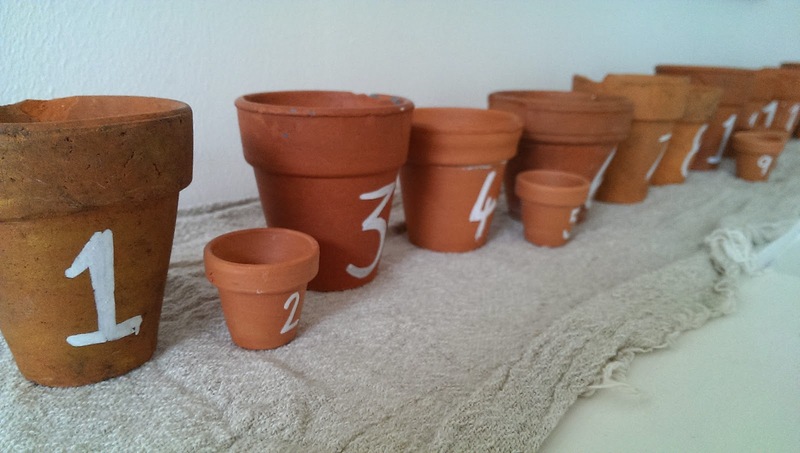 If you have old boxes or tubs you can do the same thing. 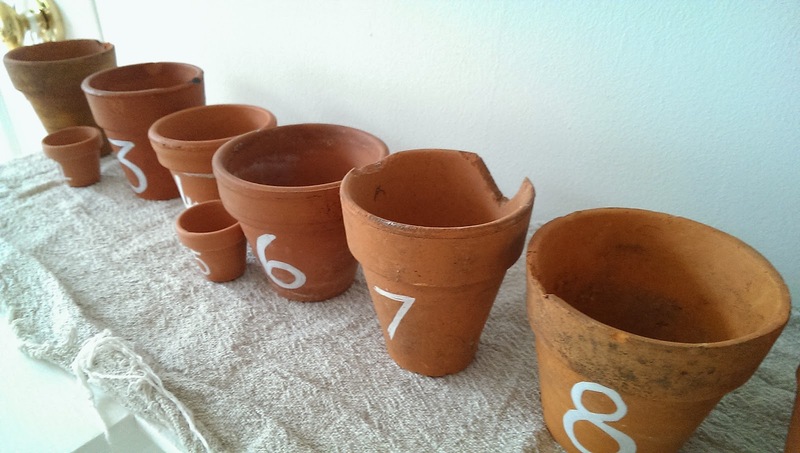 The idea also works in terracotta plant pots really well. Sorry, we've not got strawberry ice cream! Family Fashion Photo Shoot - Fire!